Since the release of 2011's Another Night, Chicago's High Spirits has been busy. On the strength of that first album, the band was invited to several notable hard rock and metal festivals in Europe in 2012 and 2013. There were also brief tours of America and Europe including stops in Germany and the UK. Now, having found time to hit the studio, they return with their second album, You Are Here. 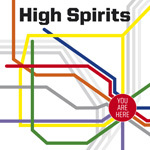 High Spirits basically sticks to their formula producing another album of melodic hard rock with a metal edge. It's part NWoBHM, part classic early Eighties American metal, developed with strong melody, rock groove, some speed at times, twin guitars, and clean vocal lines. While at times the mix seems soft, it still brings out every instrument with clarity. If you're a rhythm section fan, you'll particularly enjoy the clarity and strength of the bass line throughout. But the same could also be said of the guitars: if like classic clean guitar solos, they're in abundance here. After these things, you have some rather racing numbers with When the Lights God Down, I Will Run, and High Spirits. A more moderate pace is cut with songs like I Need Your Love and The Last Night, the latter having a rather heavy groove. Can You Hear Me Now that rock groove with sharp guitars and quite catchy chorus. You Are Here is definitely on par with their previous album, if not merely an extension of it. High Spirit's melodic hard rock/metal sound is remarkably consistent. It's brought them success in the past, so fans will probably dig this album as well. Recommended. You Are Here is definitely on par with their previous album, if not merely an extension of it. High Spirit's melodic hard rock/metal sound is remarkably consistent. It's brought them success in the past, so fans will probably dig this album as well.